"L'Angélus" is undoubtedly, with "La Joconde", the most famous painting of Western art. 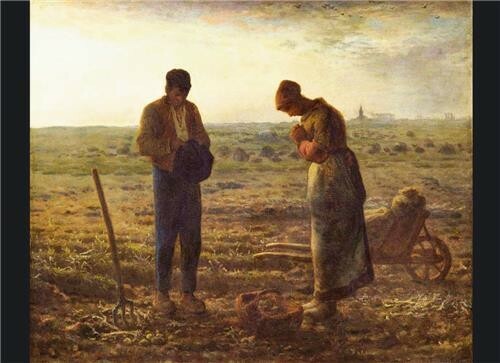 But paradoxically, the entire work of Jean-François Millet (1814-1875) is today unknown. The great international retrospective organized in 2017 at the Lille Fine Arts Museum, the first since 1975, will bring to light a profoundly inventive artist and admired by the avant-garde. For too long labeled "the painter of rural life", his paintings and drawings reveal above all the sensitive and poetic universe of an outstanding painter. Directly inspired by the myth of open spaces and the conquest of the New World, "Millet USA", the contemporary part of the exhibition, explores the American posterity of the artist through the works of poets, painters, photographers and Filmmakers, from Edward Hopper to Patti Smith, Dorothea Lange, Terrence Malick and Mat Collishaw.